Well, after moving three times in the past six months we’ve finally made it: we are in our brand new house! We’ve been here a week and it feels like home already, albeit a home I cannot believe is actually ours. 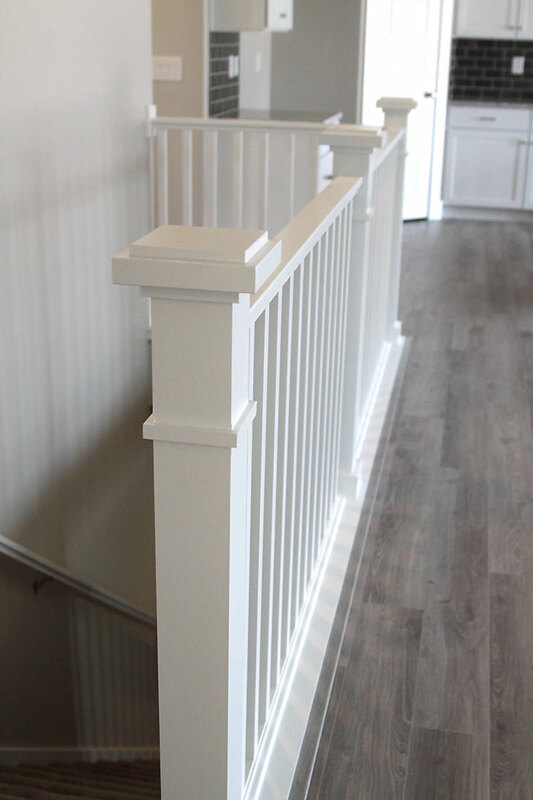 I’m going to share a few photos of our new house today and also give a quick rundown of the home building process, so that any of you who may be considering building a new home will know what to expect. Note: you may be interested in my other home building posts: should you buy or build your next home? and 9 mistakes not to make when you’re building a new home. 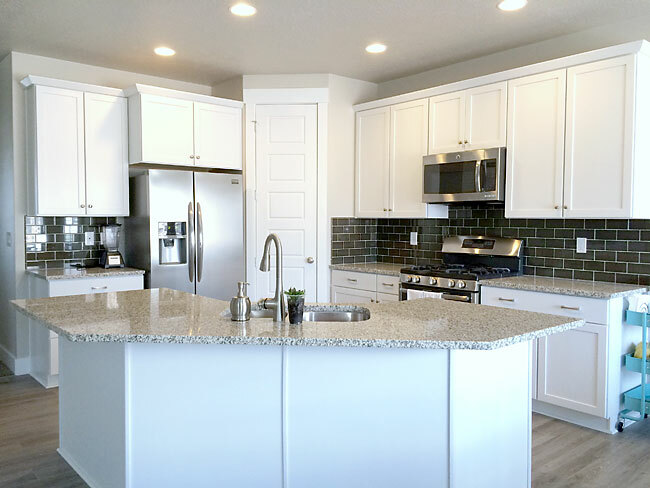 When you build a new home, you have a couple choices up front: you can either purchase a lot and then find a builder for a custom build, or you can build a semi-custom home with builder-provided floorplans in a builder-owned subdivision, purchasing the lot and home together once the build is complete. That’s what we did, so that’s what I’ll tell you about today. Choosing colors and styles and trim and flooring and cabinets and countertops, etc., can be overwhelming, so I’d recommend using Pinterest to keep track of things you like for a few weeks before your design appointment. You likely won’t be able to get everything exactly the way you want it, but having some preferences in mind will make it easier to choose options. Then you may have a few weeks or months to wait while the builder gets city and engineering permits. Finally, you’ll get word that it’s time for the dig, and that’s when things get really exciting. The hole was dug and the foundation was poured. A few days later framing began, which is really fun to watch because it goes so fast and all of the sudden there’s a house sitting on your lot. After framing, plumbing, heating/cooling, and electrical all got roughed in. The roof went on at the same time. About 5 weeks into the process, we had the 4-way meeting with the building supervisor. This was our chance to make sure everything looked good before the drywall started covering it all up. After 4-way, insulation and drywall went in. 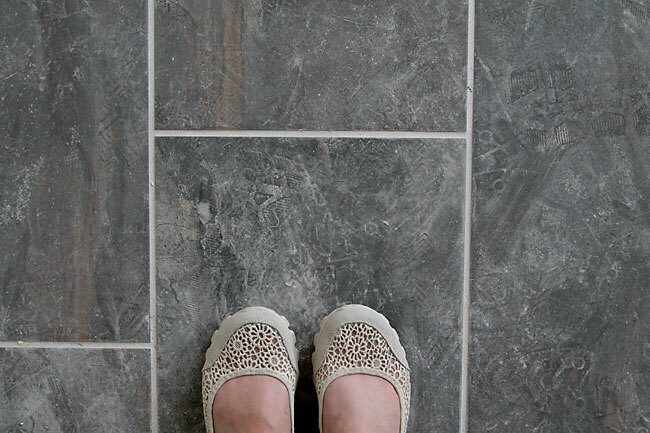 Tile was laid in the bathrooms and the walls were taped and textured. 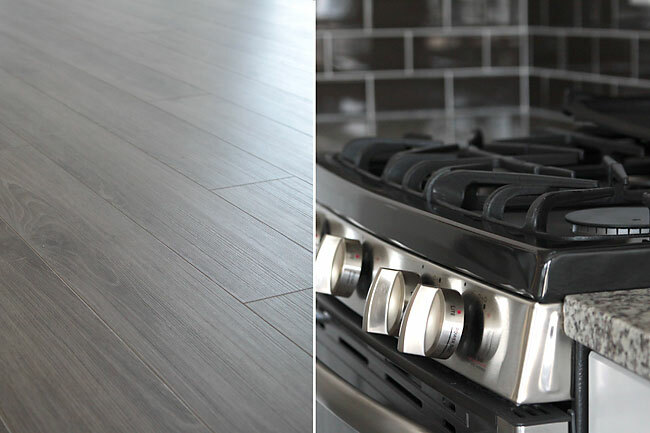 By 8 weeks into the build we had laminate flooring down in the main living areas, cabinets in the kitchen and bathrooms, tubs and toilets installed, and the exterior of the house was mostly finished. We could really tell what the house was going to look like at this point. During the last four weeks everything else got finished up: granite countertops, paint, trim, carpet, appliances, fixtures, etc. It was nerve-wracking to see everything I had chosen get put in because I kept worrying I hadn’t made the “right” design choices. However, once it was all put together I loved it. During the last week we blue taped every single nick and scratch we could find and the touchup crew came back to make sure everything looked perfect before we closed on the house. We visited the house almost every day during construction. 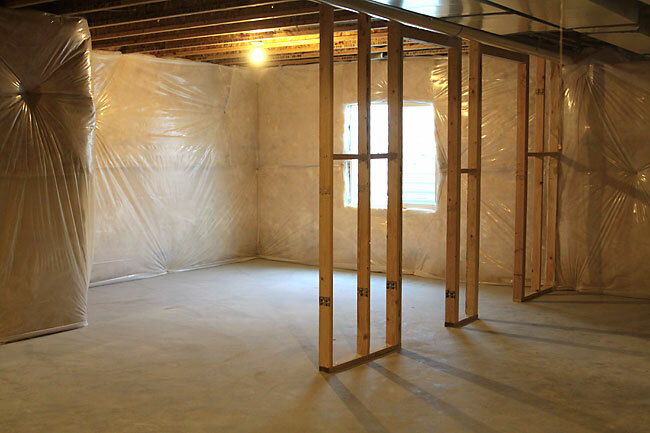 We’d heard horror stories about walls being framed in the wrong place and drywall being hung with no insulation behind it, so we wanted to make sure we’d catch anything that might go wrong. We thought some of the stonework on the front of our home looked a little crooked, so we called our agent. By the end of that business day the stone had been removed and put back up level. 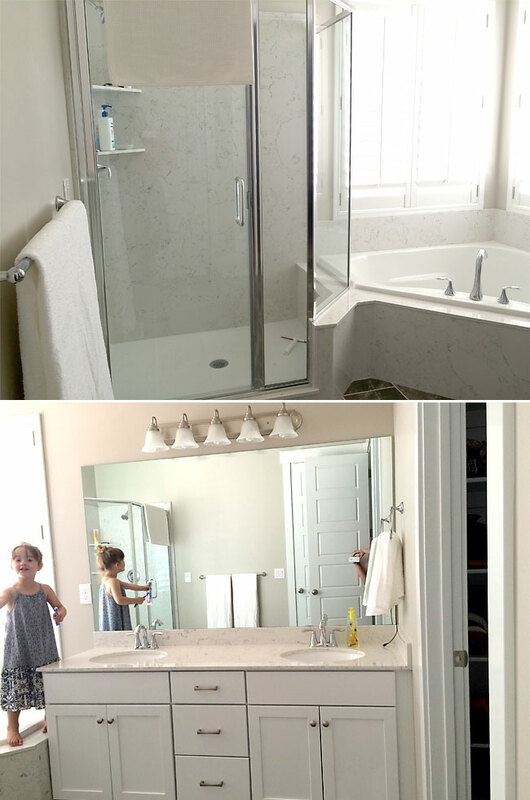 Here are a few more photos of our finished home. Since we just moved in we don’t have anything dolled up yet, but you can get an idea of the basic layout. When you walk in the front door we have a short hallway entryway that opens up into a the big living/dining/kitchen area. I’m having a great time picking out some more furniture for this area. I’m going to live in this kitchen. I love the huge island, the white cabinets, and the awesome appliances that actually do what they’re supposed to (I don’t think I’ve ever had a dishwasher before that actually CLEANS dirty dishes!). Down a hallway from the kitchen are three smallish bedrooms, two of which will hold kids and one of which is going to be my office/sewing space. I’m stoked. On the other side of the living room is a small mudroom off the garage, a laundry room and powder room, and the master bedroom and bathroom. The bathroom is ridiculously large and I love it. My oldest son is just a little bitter than my bathroom and closet combined are bigger than his bedroom, but he’ll get over it, right? Downstairs we have another bedroom and bathroom for more kids and a big family/TV room. There’s one more bedroom that’s unfinished right now which we hope to finish next summer. Finally, we have another large unfinished space that’s going to be used for storage, an exercise area, and maybe even a little photo studio down the line when I get some lighting. I am so grateful we’ve been able to move into this amazing home. We finally have plenty of room for our family of seven. I never in a million years would have thought I’d have a house like this, but we’ve been saving up for a while and interest rates are so low right now that we were able to make it work. So very happy for you! There’s nothing like being in a brand new house and I hope it’s the source of many precious memories for you and your family yet to come! Beautiful home, and wow, what a view! Wish I had seen your post before we stated building. We move into our new home in just a few weeks! I just stumbled upon this…. we just put money down on our lot with Ivory. I’m loving the colors you picked. Would you mind sharing your paint color? 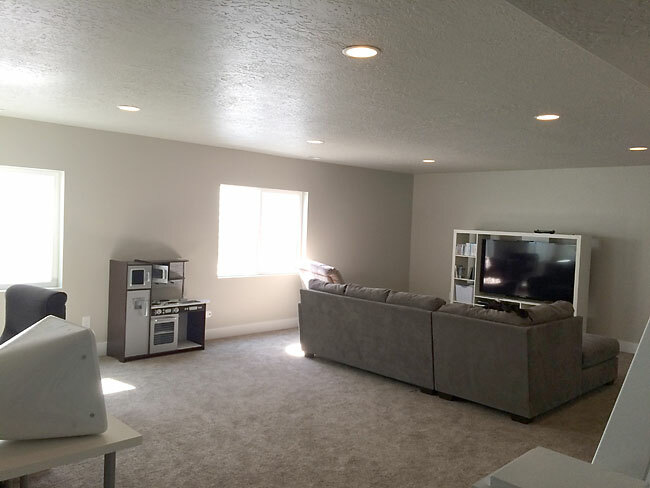 Also, do you feel it was worth it to have them finish that part of your basement, we can’t decide if it’s worth it or not. Thanks! Your house turned out so cute once all the construction was finished! I love the colors you chose for the exterior. The blue-grey looks really nice against the multicolored stone. 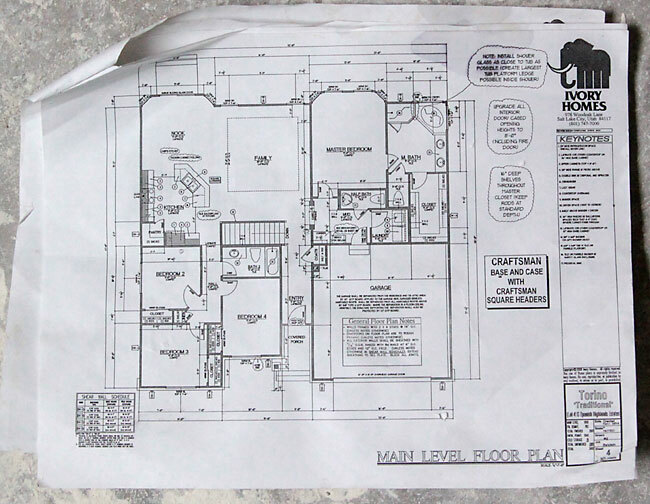 Looking at your plans come together makes me excited for the day that my family can build our dream home. Thanks for sharing all the pictures! Wow, what an absolute beautiful transformation! I am astounded at how much space there is in the photos that you showed. I love the gray and white on the exterior; it definitely provides a very modern look. My husband and I are going to be building a new home in the next few months so I am excited to see what comes of it! Your story has definitely given me a lot of hope! The ads on your website really take away from the experience. 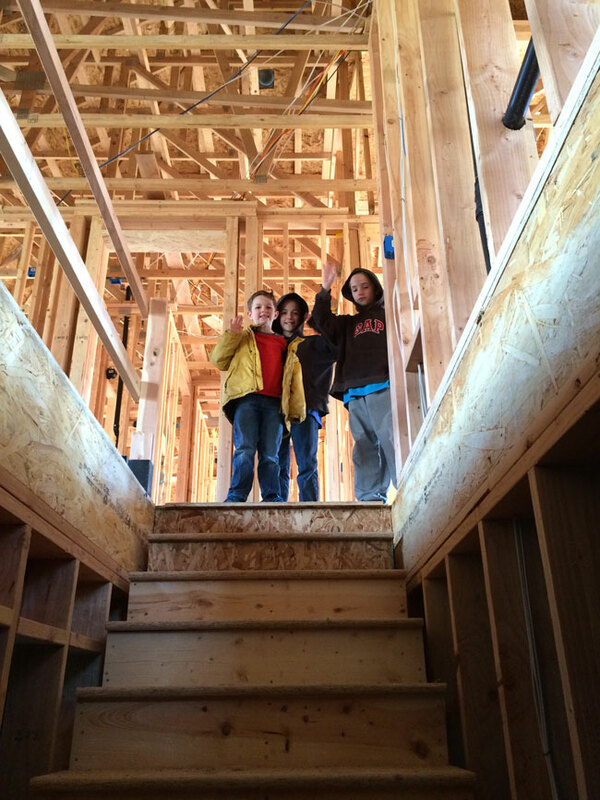 We are building a walk out basement home and love your plan! How many sq feet is the upstairs? This is the first time I’ve read your blog and your words are filled with love, just as I’m sure your home is overflowing with love. Your home is beautiful. My husband and I are building soon. Is there any way you’d email your floor plans? I’d love to see them. I love your post so much because You have done a great job on this post. 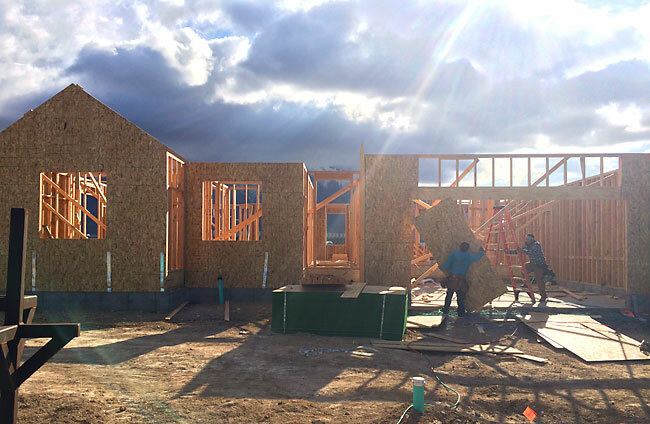 You have provided us the best information about what to expect when you build a new home. Best post and I thankful to you and your post also. 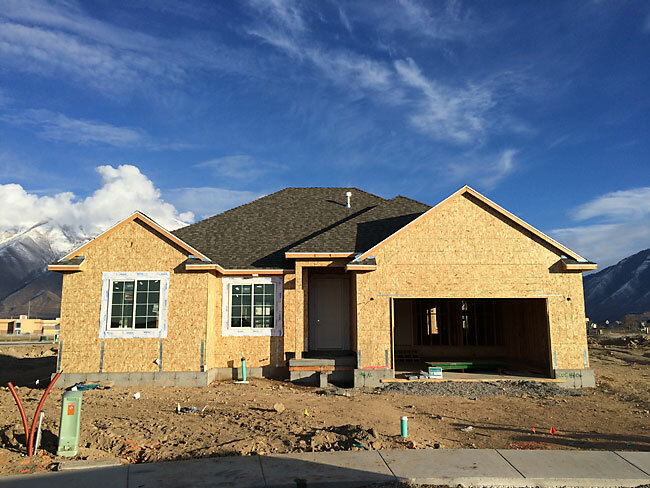 In this post you done a great job about what to expect when you build a new home. It,s so useful to us. Thanks for sharing such a interesting and informative post with us. Such a beautiful home, and I’m so glad I found your page, you addressed all of my concerns. I’m currently 25 and just got started in my career field and in about 10 years I plan on having a custom home built. I’m not sure if you still monitor comments on posts this old, but I’ll try anyway! We are just starting the process of building (as in we’ve looked at two models-waaaay early in the process!!). I was looking on Pinterest for tips and things people forget. I found your three pins for your three posts (they were all actually pinned by you, not someone else). Anyway, all three of them get a 404 page when you click on them. I tried searching your blog for “building”, “build”, and “new home” and they also all came up 404. It wasn’t until I searched for “Ivory” that I finally found your posts.